The rise of social media has created an entirely new way for librarians to reach out to patrons and ingrain themselves into the online community as a resource and a place where people can congregate. Now, more than ever, we’re present in patrons’ lives. We can share great quotes, funny cartoons, and beautiful images that will move our patrons to love libraries and reading more. That is fabulous, but the problem is that some of these fun shares often lead to a breach of copyright, whether intentional or not. 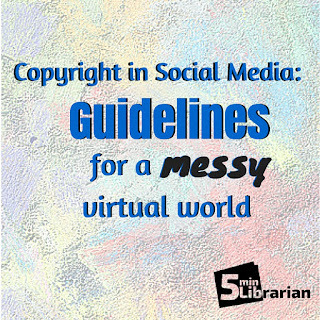 So, let’s discuss what copyright is, what fair use is, and how to stay relevant in social media without infringing on the rights of others. So: What is copyright and why do we care? Simply put, copyright is the legal ownership of a product - art, music, writing, film, etc. - usually by the person who created it. We care because using someone's legal property without permission is illegal (not to mention, not very nice). "Fair Use" is the term used for the exceptions to the copyright laws. 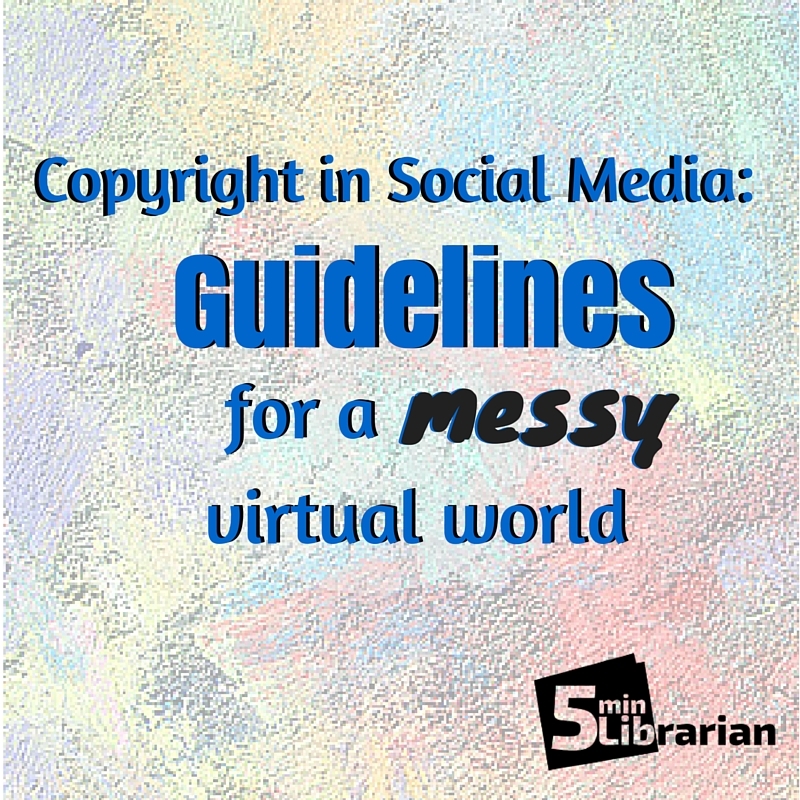 The law states that use "for purposes such as criticism, comment, news reporting, teaching (including multiple copies for classroom use), scholarship, or research, is not an infringement of copyright." This takes into account (among other things) the purpose of the use (is it for profit? Is it a parody? ), the amount used (was it a 5-second clip from a movie, or the entire movie?) and if there is any effect of the potential market for the original work. The problem with this is that the Internet has changed many, many things, and the law hasn't completely caught up yet in spelling out all the details. But the artist gets free exposure! But I've already seen it online from someone else, so it's totally fine! But it doesn't hurt anybody! What's the difference between clipping it from the newspaper to hang on my wall, and sharing it on social media? Actually, there's a big difference. This year, Instagram reported 300 million active users. Twitter reported 316 million active users. Facebook leaves them all in the dust with an astonishing 1.490 billion active users! That's a lot more than the people who walk by your cubicle every day, no matter how busy your office is. Now, granted, you might not have that many people visiting your Facebook page, but all it takes is one share for the image to go viral. So, the easiest way to avoid breaking copyright is to just ask nicely if you can use an image before you go and post it. I emailed Dave Coverly, creator of "Speed Bump," a comic that appears in over 400 print and online newspapers and websites. He was nice enough to write me back with his opinions on the subject. Coverly's website clearly states that: "Unauthorized duplication is strictly prohibited. Authorized duplication is strongly encouraged." What does this mean? It means that if you get permission, many artists and authors will happily give the okay for you to use their images, as long as they are properly attributed. So, how do you get permission? "The best way to get permission to use my work on a social media account is simply to email me and ask!" Coverly said. "If nothing else, that allows me to decide what sort of use is being requested, and if I feel like it's not being used to generate income directly, I generally am happy to say yes. The library example is a good one, because I'm a big fan of libraries and tend to err on the side of freebies for them." I was also lucky enough to email with Gene Ambaum, one of the creators of the "Unshelved" comic strip, which takes place in the library world. Unshelved tried to make things easy by posting their reuse policy online here. "We love folks sharing our comics online," Ambaum said. "All they need to do is ask for other uses (like you did). We’re pretty easy." Zach Weinersmith from Saturday Morning Breakfast Cereal also emailed me back. His attitude is much more laid-back about the use of his work. He says, "If it's not for a profit, feel free to post any of my content as long as you provide credit to the source. Thanks!" All of these artists responded within 24 hours, so not only is it easy to ask for permission, but you’ll most likely get it really quickly, too. Some may wonder, if an artist is going to give permission anyway, why ask? For one thing, it's common courtesy to let someone know you like their work and would like to share it. For another, you don't know whether they are going to agree, and since it is their creation, they should have that control on where it is shared. Says Ambaum, "I think we want content to go viral, but in a way that we have some control. This is the reason we started adding our URL to the comics, so that folks who see them out of context can come to the site if they want more. What we want are regular readers who subscribe to our emails or visit our site — that lets us make enough to continue doing the comics. The danger I see is that when folks just post images / comics / what have you to sites like Youtube and Reddit and elsewhere without the creators’ permission." So, when you do get permission, please make sure to credit the source. Coverly added that, because there is such a huge variety of opinions about sharing content in social media, there really isn't any one answer. "Personally, I feel like the barn door was left open long ago concerning images on the internet, and on social media in particular. I would love it if I received some sort of royalty every time my cartoons were "shared" or "reposted," but that's not going to happen. My concern is that they're not "used." In other words, enjoying a cartoon and showing it to friends who also might enjoy it is one thing; putting it on a website - or even a Facebook page - to promote a business or generate income is another." Social media is already changing the arena in which artists work, and "going viral" is one way for them to keep relevant and active with their fans, but, as Coverly said, "all of this goes out the window if the cartoons are not attributed. I feel pretty safe in saying that it's the number one pet peeve of cartoonists, because then it's completely unlikely the work will send anyone looking for more...not to mention the fact that it's just rude. I know the internet isn't some bastion of manners, but still..."
But I Made it Myself! All of our Content is protected under copyright and trademark laws. Any use other than personal use requires written permission. This applies to both cards created by the Someecards staff and User Created cards. You CANNOT use the Services to create advertising, promote a product, brand, Web site, social media program, community page, or Facebook fan page without written permission. If you are interested in a paid advertising or social media marketing program, please email advertising@someecards.com. We do not have a self service, free, or trade program for marketing. You CANNOT use User Created cards for marketing or audience building. If you run a community page, blog or news outlet and would like to ask for permission to use our Content, please email permission@someecards.com. So people who want to run an entire marketing campaign using these witty postcard-like images: you need to get permission first. This doesn't mean that you can't use the images; it just means that you need to ask. After all, you may have put them together, but the images and formatting belong to someone else. If you're going to share from another Facebook page or social media account, make sure that what you're sharing from is either the original source or has been in contact with them for permission. Special thanks to Dave Coverly, creator of "Speed Bump;" Gene Ambaum and Bill Barnes, creators of "Unshelved"; and Zack Weinersmith, creator of "Saturday Morning Breakfast Cereal." • Thanks for all your information, Website is very nice and informative content.